Handover a property to your customers in minutes. Yes, it’s that easy! 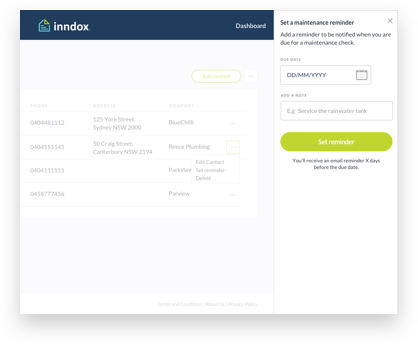 inndox is an online platform that let’s you provide property owners with an easy app to access and manage the records of their property. inndox gives your customers the power of self service so you can spend more time on your jobs and less time in the office. • You upload property files to inndox and set up their property. • They’ll get access to their handover documents via their dashboard, accessible on any device. • They can share files with their property manager and other professionals. inndox wants to make property record management easy and we're looking to partner with insurance companies, building associations, property professional associations, local government associations, state government bodies, strata software companies & property management and project management software companies. Get in touch with us to ensure yours is connected. “At Christmas time last year I had a project finishing. It was a development of four large 3 storey townhomes, the spec was high-end with a lot of custom built inclusions. There was a lot of extra paperwork for special consents and variations. Handovers have always been a time-consuming chore so we were keen to give inndox a try. Make your handover process seamless. Set up an inndox logbook for your client, today. If you would like our free guide to builder handover then send us a request .